Two more Masculine Flip Cards! I’m in love with the flip cards! (But I think I already mentioned it in this post!!!) With the new Circle flip card, it’s so easy to create this really cool card! I made one for my son’s 12 birthdays and for my brother’s birthday. Since they are a bit similar, you get a 2 for 1 today! I really like this card because when you flip the card, the car seams like it’s moving forward! 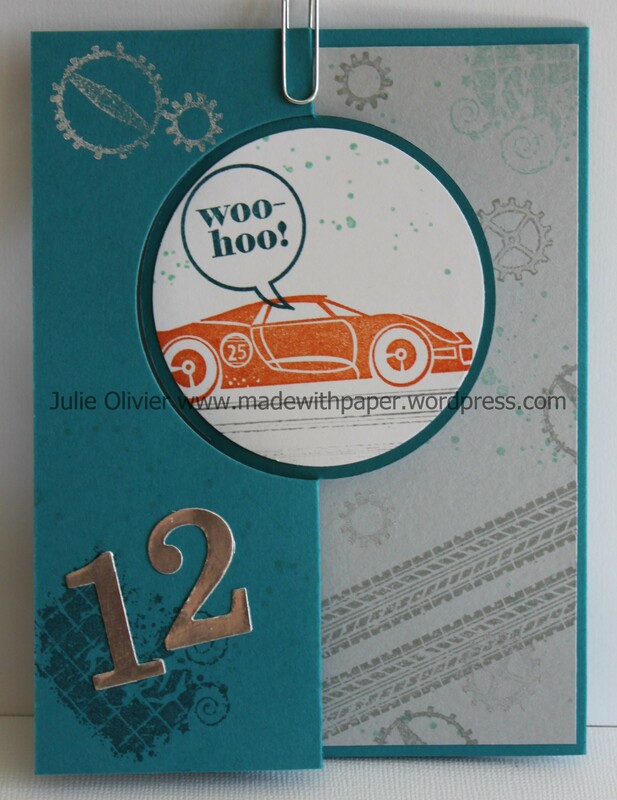 I used a few stamp sets on this card: Rev up the Fun! 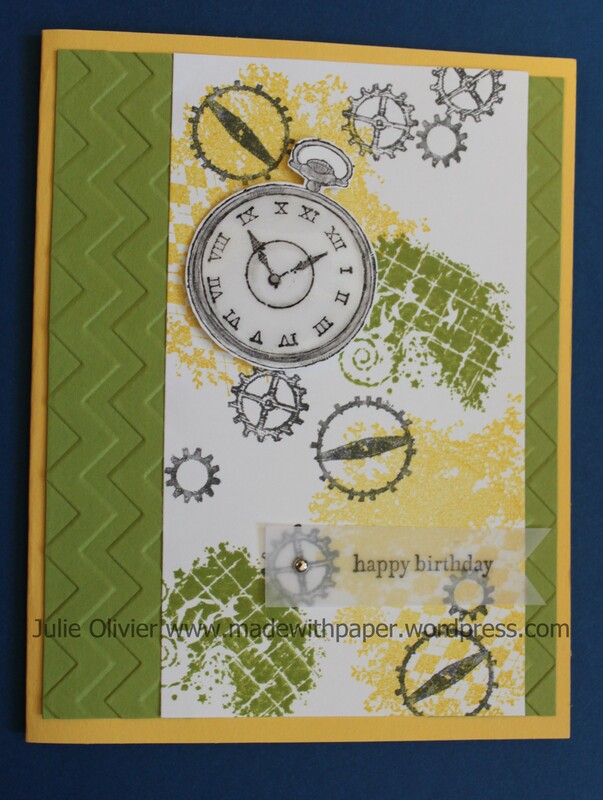 (the car and wheel tracks), Clockworks (all the gears), Gorgeous Grunge (ink splatters) and Just Sayin’ (word bubble). The card base is Island Indigo. I added a flap to write the message in the inside and I used Smoky Slate card stock on the top of the flap (RHS). 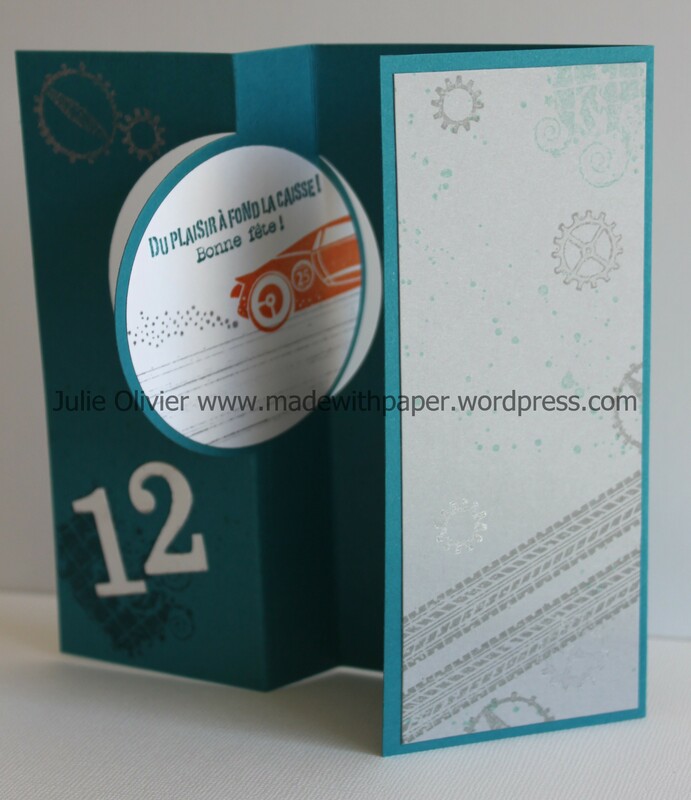 The number 12 is made with Silver Foil card stock (p.193 in the new catalog!). 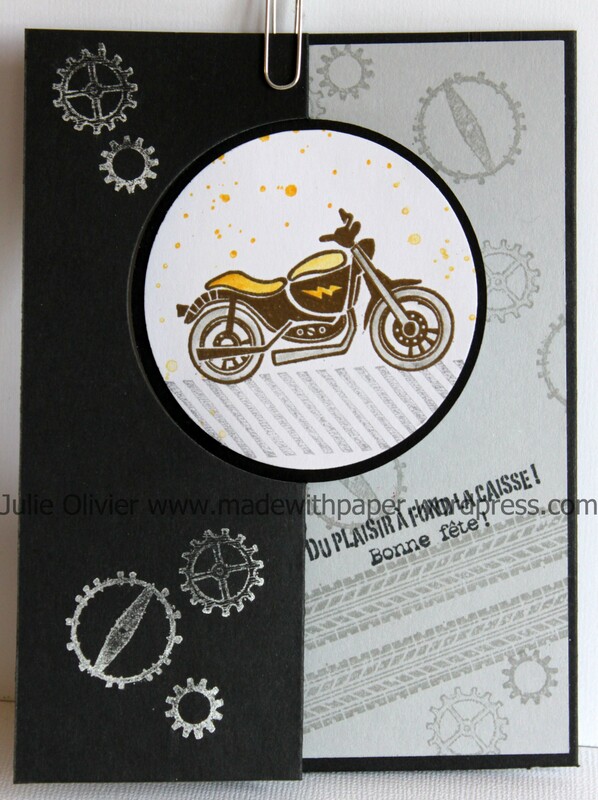 This card is Basic Black and I used Silver metallic ink to stamp the gears on the front. 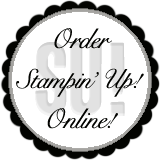 It really “pops” on the Black card stock! 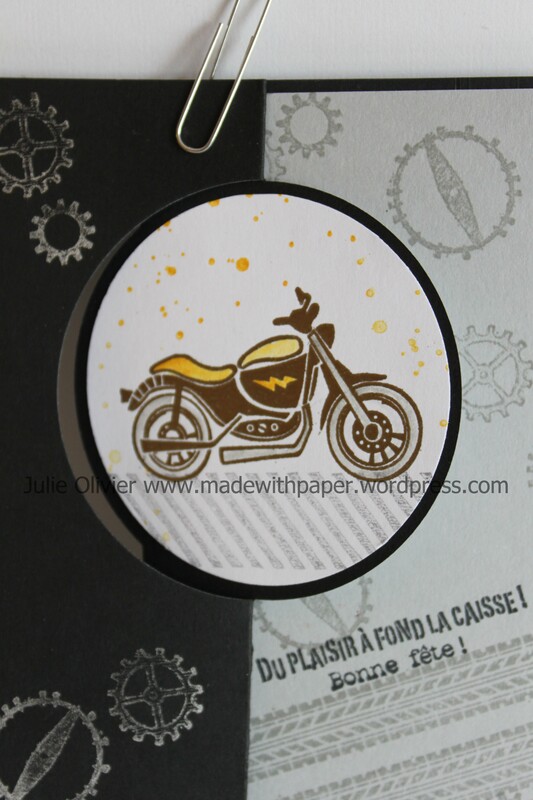 I heat embossed the motorcycle with Pewter embossing powder and colored some part with Daffodil Delight, using the Blender pen, to match the yellow ink splatters (made with Gorgeous Grunge set). The right panel is also Smoky Slate card stock, stamped with Smoky Slate ink. 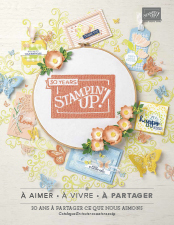 The “WOO HOO” is from a new stamp set called Bravo. 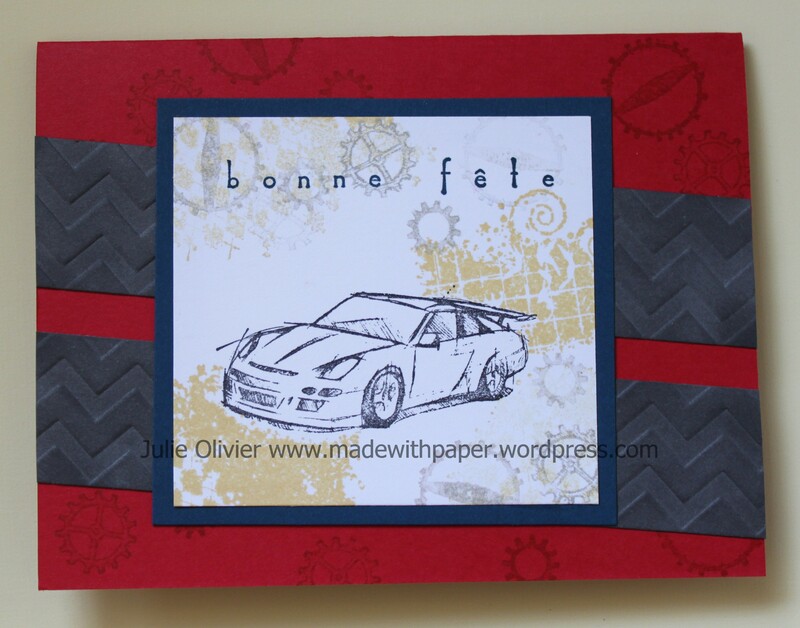 Here’s another card I made with Need for Speed stamp set! It was for my son’s friend (another one!) who just turned 10. 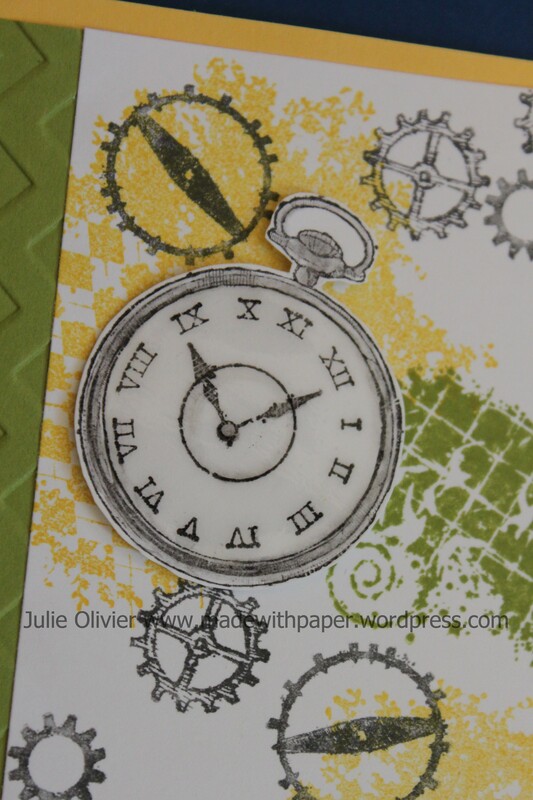 I also used “Clockworks” stamp set in the background. As I said yesterday, this set will be retiring soon and I’m a bit sad because it was such a great stamp set for boy’s birthday cards!